The goal of business is to make a profit. Many small businesses fail at this because they don’t know how to price their products or services, but pricing is the critical element to achieving a profit, a factor that all firms can control. There are many factors to consider when developing your pricing strategy, both short- and long-term. However, when you are placing a price on a business, if value proposition and positioning are aligned, you’re in the best situation to maximize revenue and profits. 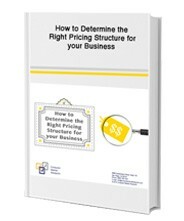 Fill out the form on the right to download your free copy of “How to Determine the Right Pricing Structure for your Business”.